JANAKPUR, September 11: Putting aside the agenda of constitution amendment, major political parties contesting in Province 2 are soliciting votes by promising local development. The agitating Rastriya Janata Party Nepal (RJPN), which earlier announced not to participate in the poll without amending the constitution, has also made local development works as its main agenda for soliciting votes. Various political parties such as Nepali Congress and CPN (Maoist Center) that stood in favor of the constitution amendment have relegated this issue during the election campaign in Province 2. Their main agenda for the election campaign has been local development. Except in the places where they think that the constitution amendment issue influences their votes, the parties are hardly found raising the issue of constitution amendment during their door-to-door campaign for the September 18 polls. 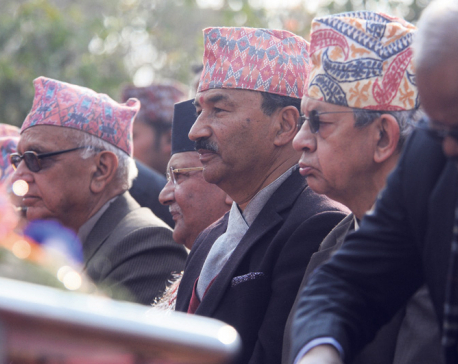 However, a section of leaders of the ruling parties as well as RJPN are also found active in trying to create opinion against UML as a spoiler of the constitution amendment bid. They have tried to project UML as an “anti-Madhesi” party and the party with “anti-development” agenda. While the NC, Maoist Center and RJPN have maintained that Madhesi people won't get their due rights until the constitution is amended, UML has been saying that the amendment is not going to bring any change in the rights or in the lives of Madhesi people. Yadav also said that it was UML which took initiatives to bring the amendment in the constitution on the issue relating to the citizenship certificate. He said that his party had given priority to development and prosperity. A leader of CPN (Maoist Center) urged not to exaggerate the issue of constitution amendment as the agitating RJPN has already agreed to participate in the poll. “The issue of amendment has reached to a conclusion through a due process. Since you [journalist] also have responsibility to resolve the problem of the country, do not raise the issue in this election,” he said. RJPN leader Parameshwar Sah said that their movement which is aimed at empowering Madhesi people with their rights is still continuing. “Our fight for various issues including the demarcation of province, language, formation of national assembly and citizenship certificates is still underway,” he said, adding that it was only the form of the protest that has changed now. RJPN mayoral candidate for Jaleshwar Municipality Ram Shanker Mishra said they have decided to take part in the poll as part of their ongoing movement. “We have not left our agenda of constitution amendment. But we have changed the form of the protest to establish the party to achieve those goals,” he said. A local of Dhanusha, Nagarain Ram Bilaya Roy, said parties seeking for their votes did not talk anything about constitution amendment. “They talk about the development of the places. They talk about nothing else,” he said, adding that the senior leaders had not reached to them yet.